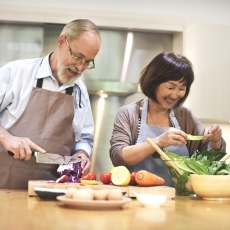 What is nutrition and why is it important for older adults? Nutrition is about eating a healthy and balanced diet so your body gets the nutrients that it needs. Nutrients are substances in foods. They include carbohydrates, fats, proteins, vitamins, minerals, and water. Good nutrition is important, no matter what your age. It gives you energy and can help you control your weight. It may also help prevent some diseases, such as osteoporosis, high blood pressure, heart disease, type 2 diabetes, and certain cancers. But as you age, your body and life change, and so does what you need to stay healthy. For example, you may need fewer calories, but you still need to get enough nutrients. Some older adults need more protein. What can make it harder for me to eat healthy as I age? How can I eat healthy as I age? Avoid empty calories. These are foods with lots of calories but few nutrients, such as chips, candy, baked goods, soda, and alcohol. Pick foods that are low in cholesterol and fat. You especially want to try to avoid saturated and trans fats. Saturated fats are usually fats that come from animals. Trans fats are processed fats in stick margarine and vegetable shortening. You may find them in some store-bought baked goods and fried foods at some fast-food restaurants. Drink enough liquids, so you don't get dehydrated. Some people lose their sense of thirst as they age. And certain medicines might make it even more important to have plenty of fluids. Be physically active. If you have started losing your appetite, exercising may help you to feel hungrier. What can I do if I am having trouble eating healthy? If you are tired of eating alone, try organizing some potluck meals or cooking with a friend. You can also look into having some meals at a nearby senior center, community center, or religious facility. If you are having trouble swallowing, try drinking plenty of liquids with your meal. If that does not help, check with your health care provider. A health condition or medicine could be causing the problem. If an illness is making it harder for you to cook or feed yourself, check with your health care provider. He or she may recommend an occupational therapist, who can help you find ways to make it easier. Article: Relationship between nutritional status and frailty in hospitalized older patients. Article: Peri-operative optimisation of elderly and frail patients: a narrative review.